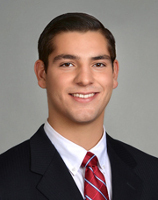 Nicholas Bucchio joined Cushman and Wakefield | Pyramid Brokerage Company in January 2017 as a Marketing & Research Intern. After the Spring semester Internship he went on to intern at Cushman & Wakefield’s 1290 Avenue of the Americas New York location. Nicholas has now obtained his NY Real Estate License and is working at Pyramid Brokerage of Albany. He has familiarized himself with two different Commercial Real Estate markets and is looking to use that knowledge to accommodate his clients needs. Nicholas is currently a Junior at the University At Albany. There he is involved in various extracurricular organizations such as the Business Investment club, Kappa Alpha Pi Pre-Law Co-Ed Fraternity, along with holding the position of Resident Assistant. He will graduate in May 2019 with a Bachelor’s degree in Business Administration with a concentration in Finance & Entrepreneurship which will further progress his career in commercial real estate.